The Royal Library of Alexandria, or Ancient Library of Alexandria, in Alexandria, Egypt, was one of the largest and most significant libraries of the ancient world. It flourished under the patronage of the Ptolemaic dynasty and functioned as a major center of scholarship from its construction in the 3rd century BC until the Roman conquest of Egypt in 30 BC. The library was conceived and opened either during the reign of Ptolemy I Soter (323–283 BC) or during the reign of his son Ptolemy II (283–246 BC). Plutarch (AD 46–120) wrote that during his visit to Alexandria in 48 BC Julius Caesar accidentally burned the library down when he set fire to his own ships to frustrate Achillas' attempt to limit his ability to communicate by sea. After its destruction, scholars used a "daughter library" in a temple known as the Serapeum, located in another part of the city. 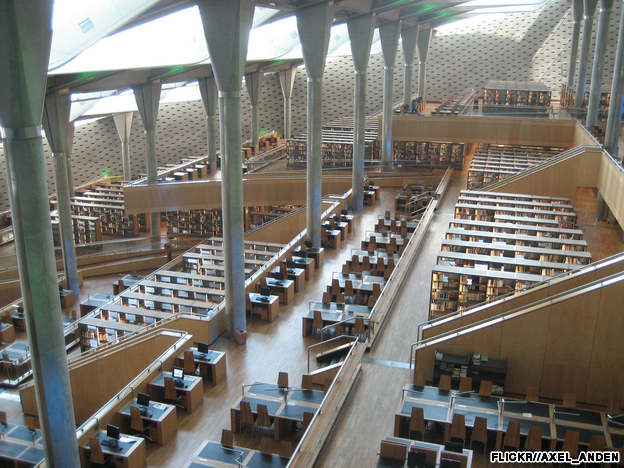 Intended both as a commemoration and an emulation of the original, the Bibliotheca Alexandrina was inaugurated in 2002 near the site of the old library.